We had friends around for dinner on Friday and I decided to make a dish that we have not had for sometime. I cannot imagine why I have not made it recently, as it is delicious, and I thought that I should share it with you. If you don't touch alcohol, it's time to stop reading right here!!!! I have been using this recipe for donkey's years and I have no idea where it came from originally, but I first published it some years ago on my own website. Chop the dates and divide into 2 equal portions. Add the bicarb to one half and pour the cup of boiling water over. Stir to mix and leave to cool. Cream together the butter and the sugar, add the beaten eggs and mix well. Sieve the flour, baking powder and salt and fold into the butter mixture. Add the second portion of dates together with the nuts. Stir in the dates and bicarb mixture and mix thoroughly. Turn mixture into a large oven proof dish. Bake for 40 – 50 mins at 180ºC (350F). Meanwhile, make the syrup. Heat the sugar, butter and water together for 5 mins. Remove from the heat and stir in the vanilla essence, salt and brandy. Pour the syrup over the hot tart when it is taken from the oven and allow it all to soak in. Serve hot or cold with crème fraiche, cream or custard. Sorry this was all that was left when I remembered to take a photo!!! It is making my mouth water reading this. I will be puting this in my recipe file. Just the way to warm yourselves up in Autumn, though I'd be leaving out the walnuts as I just don't like them. I thoroughly approve of the brandy - of both the quantity and that it isn't added until after the lovely sauce is cooked! Wow, this looks like a perfect pudding for the time of year. No wonder there was hardly any left. Thanks for the recipe !! I don't blame you, I wouldn't have remember to take the photo also with a delicious pudding. If I had been at your table, I would have devoured this. No wonder you didn't have time for a photo! This is exactly the kind of real pudding which we so much enjoy and which is rarely obtainable unless, like your friends on Friday evening, one is fortunate to be invited to dinner at the home of someone, such as yourself, who is also an excellent and imaginative cook. lovely! I am hungry now! Hi Diane, how are you? Looking at your almost empty dish ...your pudding must be extremely good. 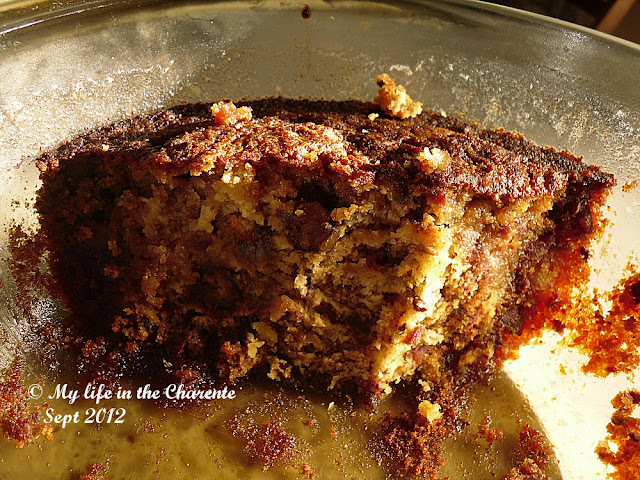 Love the combination of walnuts and dates. Absolutely delicious. I don't have a lot of trouble touching alcohol. I'm afraid I can be a bit of a recipe nerd and so the thought of where this recipe might come from has made me particularly nerdish. It does appear to be based on Francis Coulson's original Sticky Toffee Pudding recipe from the 1960s. I don't think that had walnuts - the first time I saw walnuts added was when Gary Rhodes made a version sometime in the 1980s. The original sauce was very, very rich with lots of double cream and I definitely prefer your syrup. I'd love to know who first added brandy, though. Sorry, I'll stop being nerdish now. This got me thinking that the allegedly unknown origins of British sticky toffee pudding might actually be South African. But then I found some date pudding recipes with sweet sauces going back to the 17th century, so I think it's probably too complicated for me to think about any more. Just enjoy the results methinks! A pudding/cake tart with a brandy topping? It sounds/looks scrumptious! Mmmm, that cake really looks yummy. Hmmm.. Diane, that looks delicious!! Very nice to see how enterprising you are, to make all those delicious things. It is that you do not live near me, otherwise I would have liked a piece to taste,..hihi..!! This looks so delicious Diane! A real Autumnal bake:) Have a lovely week. La photo prouve que la tarte est délicieuse puisqu'il n'en reste pratiquement plus rien. J'ai des dattes. Je note. This looks so delicious and rich! How moist!! My mother loves cakes with fruit cooked in. I love dates! OMG how sinful is this....YUM! I'm not too keen on brandy but your cake looks like it would be delicious without the brandy! That sounds and looks Delicious. Great recipe. YUM! I think it looks delicious. What a delicious dessert. I love old recipes. They don't skimp on any ingredients. I made something like this, but with raisins, a while back. I don't remember what it's called, but I do remember the bicarb mixed with the fruit. It's divine for fall or winter! Yours is beautiful. Mmm. This went into my dessert file right away... Love those boozy desserts and this one is a real keeper... and one that's hard to shoot since I would want to eat every morsel. That is a recipe I would love to try, especially after so many hours in hides! Much love Diane, take care and enjoy the last of your garden! Diane, I have never had a recipe like this before but dates and brandy sound like a lovely combination. Sounds delicious, a delightful fall treat! The picture tells how good it was! Sounds like the perfect pudding for a winter's night supper party. I shall have to try it. Mary the shingles is much improved but the cough will not go away. Apparently I have damaged bronchi from 2 doses of pneumonia. I am still on treatment, but it is very slow. Mr FD hates dates, so I'm not sure that would go down too well in the Dormousehold. But it doers look delicious! That tart looks might tasty! And the recipe is simple enough that even I could make it. Your photo has me literally drooling on the keyboard! It looks and sounds absolutely delish with all that brandy. Have a great weekend Diane. Diane, the photo says it all! No need for another one! :D It actually looks as good as it sounds, now I just need to taste it! I miss you, I hope I can be back for more soon. Now, that really looks tempting! I like tarts of any kinds! PS... I apologize for not visiting often, so busy with DIY projects hehehe. Your comment is always appreciated!